Well, the winter Olympic is just around the corner and if you are coming over to Vancouver, do consider checking out all the above bloggers’ blogs as they will definitely provide you with some great ideas to dining out in Vancouver. They have diligently scout through and reviewed all of the restaurants and eateries here in Vancouver! 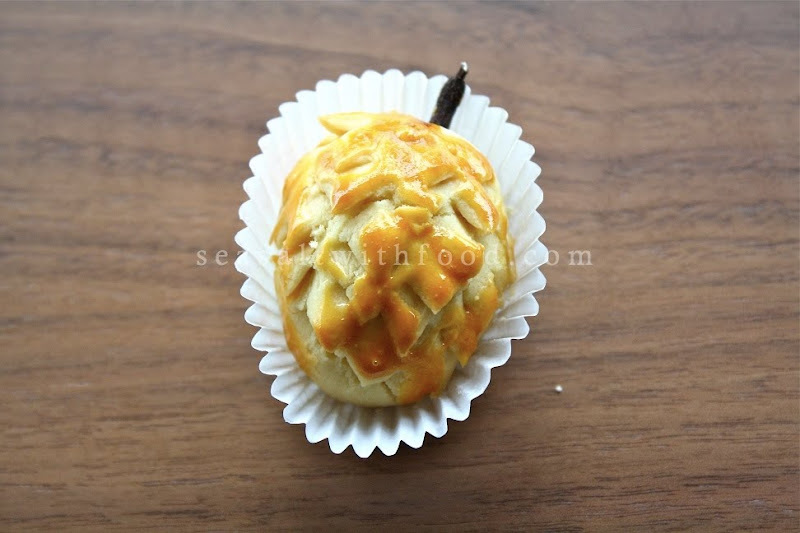 Anyway, back to my Pineapple Tarts post. I posted this recipe about a year ago and received many emails asking me about the technique used to wrap and shape the tart into little pineapples. Well, here is the pictorial guide and for the first time, I am also including a video guide as well to guide you through this easy process. Blend the pineapple chunks in a blender or a food processor. Then pour into a sieve and drain off some of the juice. Place the pineapple, sugar, cloves, cinnamon stick and pandanus leaves in a heavy bottom saucepan and cook over a low heat. Adjust the sugar accordingly. Stir frequently until the jams are slightly thick and add in the golden syrup. Then cook until the jam is thick and glossy. Remove from the heat and set aside to cool. Then roll the pineapple jam into a small cherry sized balls. Preheat the oven to 180˚C and line baking tray with parchment paper. In a large mixing bowl, combine the butter, sugar and salt. With a wooden spoon mix until they are well combined and add the egg yolks and vanilla extract. Then mix in all the sifted flours and knead lightly to form soft dough. To shape the tarts - Flatten a piece of dough (about 15 g) with lightly floured hand and place a piece of the prepared pineapple jam in the center, wrap and seal well. Roll the tart lightly into an oval shape and snip the surface of the pastry with a small scissors to form a spiky look. Then insert a clove into one end. Brush the pastry with the egg wash and bake for about 20 minutes or until they are light golden in color. 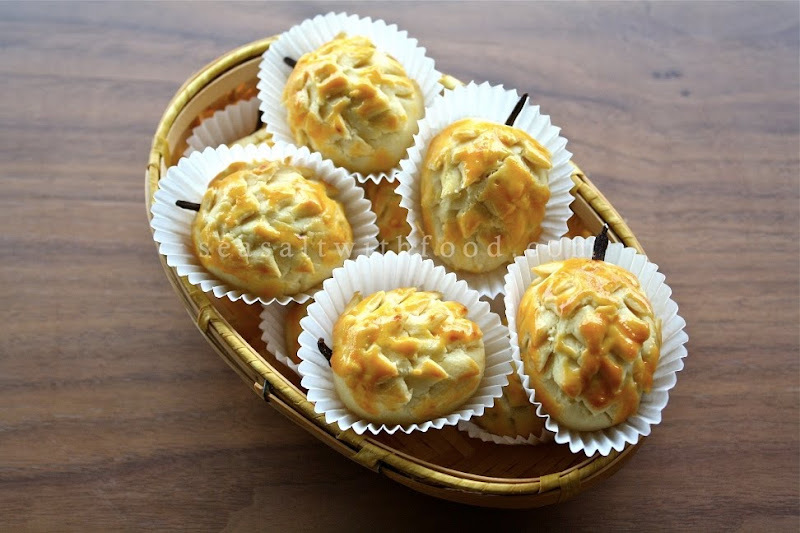 Cool on the rack and place the pineapple tart in small baking cups and store in airtight cookie jar. Wow, yours look so beautifully shaped with the perfect golden color! This is a very labor intensive pastry, however, I am sure that the labor is all worth while when you see the people enjoying this pastry. They are so beautiful Angie! And thanks for the video too. Love the view behind! What's the ratio of pastry to filling that you use? Because if you wrap more filling, when you snip it with scissors, it'll easily cut through the fillings no??? Hi Quinn, thanks for the compliments. The ratio of pastry to filling is about 15g:8g. Wow....these are so cute like mini pineapples. They are great for Chinese New Year. I have always wanted to make these. Thank you for the recipe. Hi Angie, I am new to your blog and I do applaud overseas chinese like yourself, who make all the effort to stay true to their Asian epicurean roots. could you tell me the equivilants of what the grams are to cups for the sugar, syrup, butter, flour... etc. i would GREATLY appreciate it. 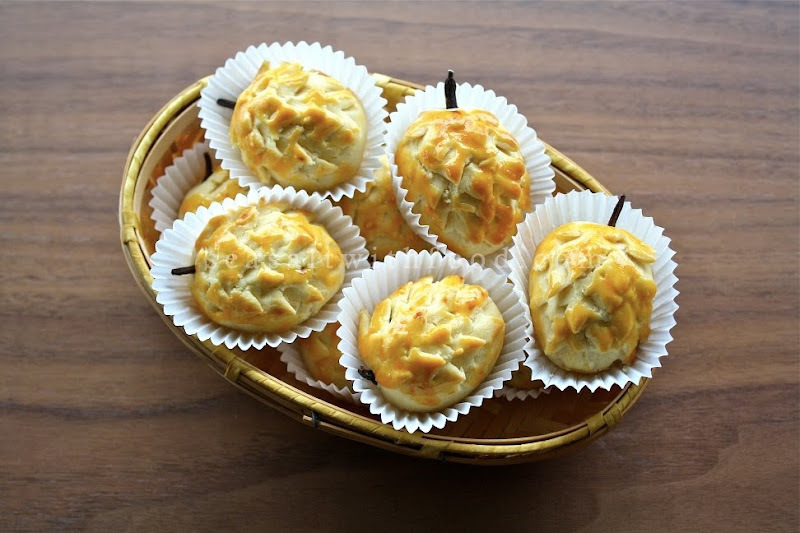 I've tried making pineapple tarts like these, but it did not come so well like yours. wow..you are good.